After taking an impressive detour in 2008 with standalone thriller IN THE DARK, Mark Billingham now brings back his popular protagonist, DI Tom Thorne, in the eighth instalment of his acclaimed crime series set amongst the seamy world of greater London. And what a return it is for the gritty yet layered detective. In BLOOD LINE, a seemingly unremarkable domestic killing becomes far murkier when a bloodstained X-ray sliver is found in the dead women's hand - a dead women whose mother was murdered by notorious serial killer Anthony Garvey years before. As more relatives of Garvey's victims are murdered and more slivers appear, DI Thorne tries to hunt a twisted psychopath and prevent further deaths, while stumbling over his own feelings in the aftermath of an unexpected personal tragedy. 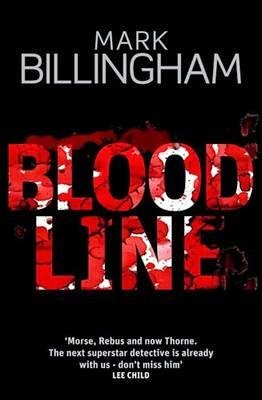 Once again former TV actor and stand-up comic Billingham delivers crime fiction of paramount quality. In a genre where some writers focus on breathtaking plots, others create fascinating characters, while still others shine solely with great dialogue or well-evoked settings; the best of the best consistently deliver across all fronts. As Billingham does with BLOOD LINE. Populated with a rich cast of authentic, layered, characters, BLOOD LINE is an exciting, well-constructed tale filled with texture and depth. In amongst the action, readers organically learn a little more about both Thorne and the well-drawn supporting characters. There is even a pleasant reappearance of retired DCI Carol Chamberlain of the "Crinkly Squad". The dialogue is natural, packed with subtext. Dark crime is peppered with dark humour. The twists are surprising but realistic, never forced or gimmicky. Billingham's books all range from good to great, but BLOOD LINE shows him at the height of his very considerable storytelling powers. Picking it up during a fortnight spent reading several crime novels really underlined for me Billingham's mastery of the genre. I immediately found myself caught up in the flow, barrelling along through the pages, discovering things about story and character naturally as the action unfolded. There was no hint of being pulled out of the story by plot contrivances, clunky dialogue, or the many other marks of less-talented authors (who try to force things in certain directions). First-time readers of Billingham will discover an impressive read, whereas long-time fans will enjoy the continued evolution of Thorne and other familiar faces, and be more than happy with this excellent addition to a top series. Put simply: BLOOD LINE is a taut tour de force, from a true master.